Hello all and thank you for stopping by today to help celebrate the launch of September My Monthly Hero Kit from Hero Arts (more about the kit and blog hop below). 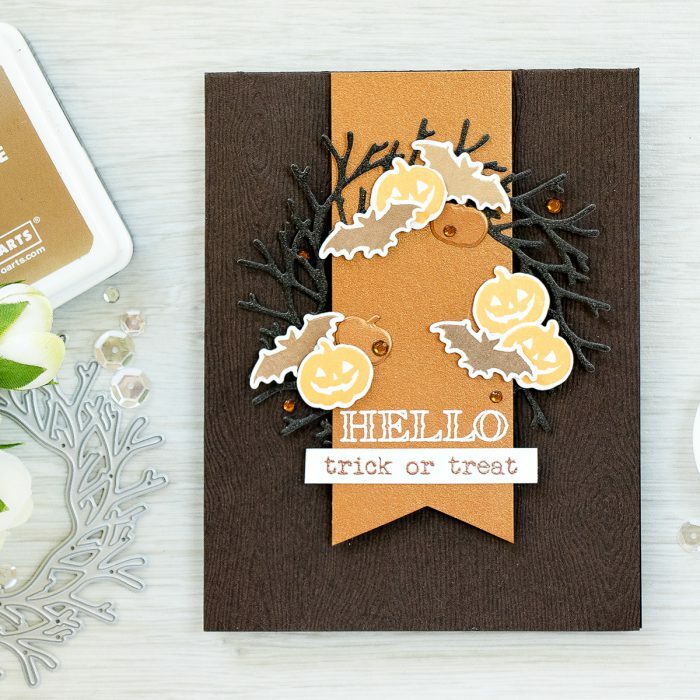 If you are a fan of wreath dies you are going to love this kit! I’m not going to lie, I got over the moon excited when I saw all of the wreath dies available in both main kit and add-ons. Each has a fantastic design and they all work wonderfully for all sort of occasions, I’m sharing a Halloween and a Christmas one. I wanted to keep my cards simple, so I die cut a wreath out of glitter paper, I used black for the Halloween card and gold for Christmas and also cut a banner shape out of cardstock included in the main kit using my scissors. I just had this idea of letting the banner go trough the wreath; I’m sure I’ve seen it somewhere (like in a magazine or online) and I loved that idea. Once my base was created I stamped and die cut various images to dress up my projects. I went with carved pumpkins and bats for the Halloween card (I used yellow and brown ombre inks); and holly leaves and berries for the Christmas card (I used Soft Olive and Forever Green; Pale Tomato and Red Royal). I also die cut some additional images using dies and shimmer cardstock. To create sentiment for these I used non-kit Hero Arts stamps – the Autumn to heat emboss Hello and this year’s Christmas Messages to heat emboss Peace & Love. 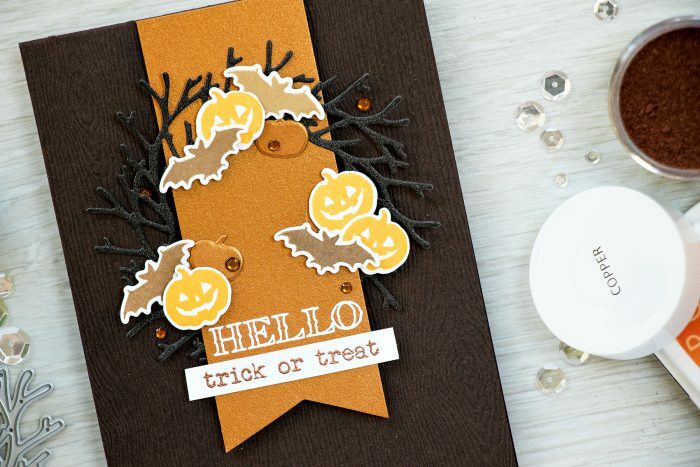 I really love how simple these cards are and how the wreath dies can be used for many occasions. Replace pumpkins with flowers and butterflies and you have a Spring wreath. Add some pineapples – and you have a Summer one. Sky is the limit here. The kit is available for a limited time only – once it’s gone, it’s gone. If you love it – better grab it now! 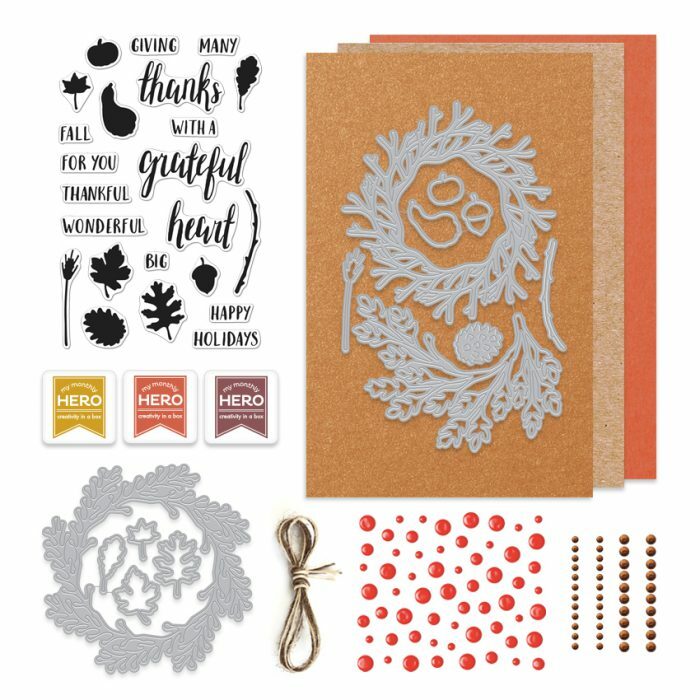 The kit contains: A set of three Fancy Dies designed for building your own wreath; 4×6 clear stamp set; Ten coordinating Frame Cuts dies; Three ink cubes in Mustard, Rust and Deep Burgundy; Six half sheets of cardstock in Kraft, Sunset Orange and Metallic Copper; Custom Freckled Fawn Enamel Dots in red; Brown gems; Brown and Natural Jute twines. The kit value is over $65, and Hero Arts is selling this one for $34.99. You can now subscribe to receive the kit monthly and never miss one! Yana Smakula – you are here! Hero Arts is giving away one kit as a prize to one blog reader – selected from the comments across all of the blogs in the hop so be sure to leave a comment for your chance to win! Your cards are beautiful! Can’t wait to get my kit! As always, your cards are awesome. This kit looks so versatile. Great cards, Yana! I especially like the Christmas one. This is a fabulous set! Thanks so much for sharing with us and for participating in this great hop and giveaway! Such beautiful cards. Thanks for sharing. Your cards are adorable, pinning to my Pinterest boards. Hi Yana, I love wreaths and all things botanical, so this kit speaks to me, too. 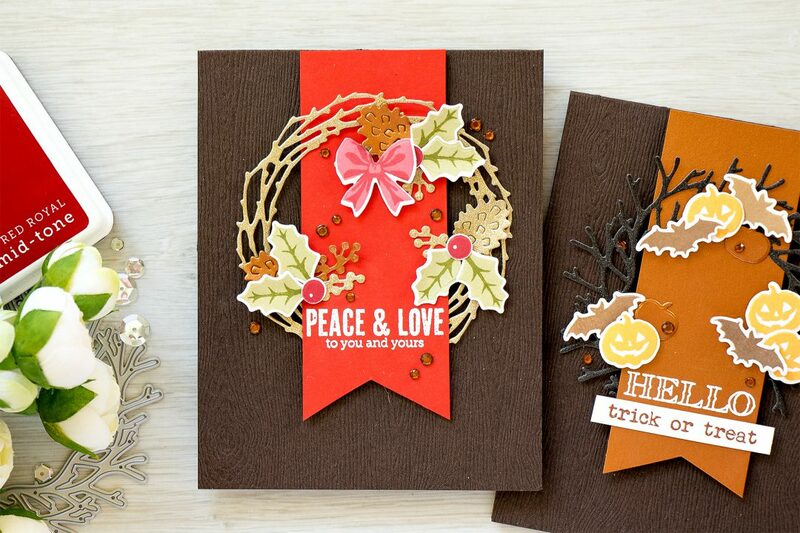 I also love the idea of wreaths for all seasons and holidays…your cards are great! love your cards, just beautiful, they look a like but so different. Thanks so much for the great ideas. Both cards are awesome but I am really loving the Halloween one! I too got excited when I saw the wreath dies. Been wanting to buy one but. So glad I waited. Thanks for sharing your beautiful cards. I really think the Halloween card is cute! So sad that the kit sold out before I could get one ordered. This was a fabulous set! thank you, Sandy! 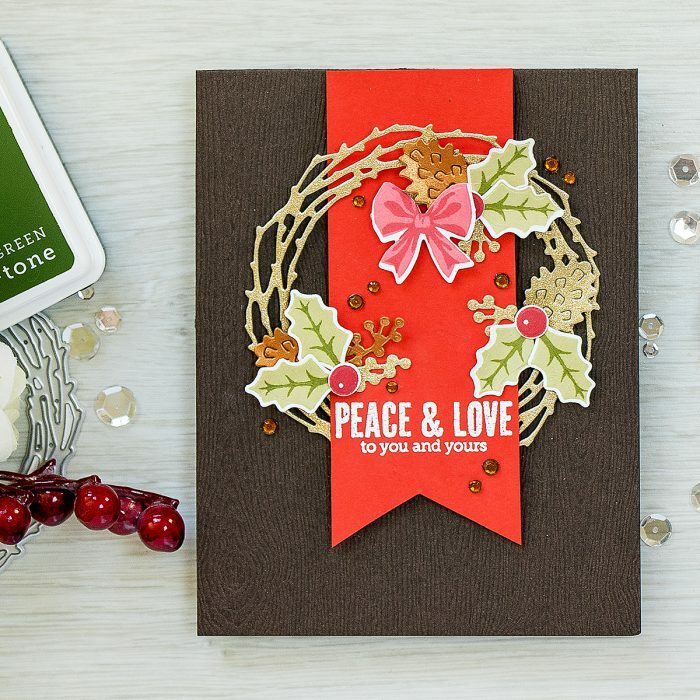 You can still get the add-on dies, the wreath I used (on a Christmas card) is from an add-on set. Yana, I love the simplicity and elegance of your cards. I missed out on the kit, but will definitely have to get the items separately. They are just too awesome! The black Halloween wreath is such a great idea! Thanks for sharing your cards. Love these wreath dies! So many ways to use them. Love the cards Yana! Beautiful samples. The Christmas wreath is my favorite. I love your layout. Thankyou for sharing. Love your cards, they are so pretty. Love your cards. The Halloween card is my favorite. Thanks for sharing. You inspire me for fall. I really like the Halloween card, but both are really pretty. Thank you for sharing your card ideas, Yana. WOW, how beautiful, the colors are just stunning! These are just great. Really get a sense of the versatility! Great wreath designs Love the Halloween the best!! Your cards are great. I like how you mixed in some of the add on items to really show how to mix and match the products. Your cards are just gorgeous, thank you for sharing!! Both of your cards and the stamp set are amazing. The Halloween one is my favorite. Thanks ! Great cards! This kits looks like it’s a really good one. Great technique and cards! I like how you took the banner through the wreath and and things you added to it!! Thanks!! Such wonderful cards. Crossing my fingers I might actually win this fabulously amazing kit, since it had already sold out when I wanted to buy it. I like all the texture on the cards with the layering of dies. Very pretty cards. 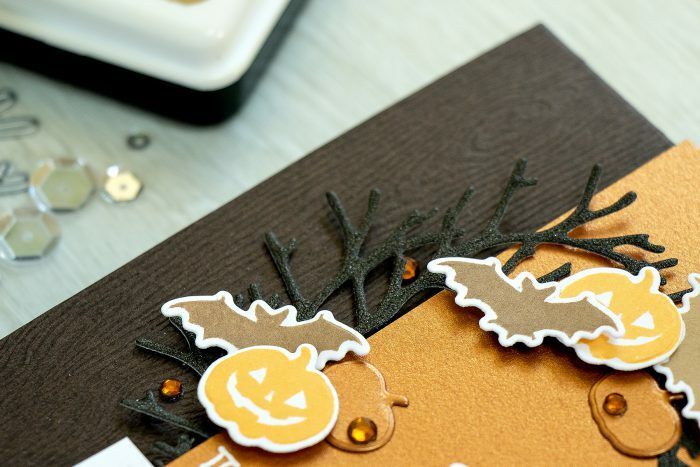 Love the colors and that woodgrain cardstock you used for your card base. I really like the Halloween wreath. That woodgrain cardstock is cool! Hello Yana, love your simply spectacular cards. Thanks for sharing the versatility of this kit. The wood grain paper is so cool. Thank you so much for the chance to win. Lovely projects, both of them. Hello Yana, loved your interpretation of this kit with your 2 wreaths. So simple but simply spectacular. Loving that wood grain paper. Fantastic job as always. Beautifull cards, Yana! Looking forward to giving these a try!